Where is Western Academia's Outrage at Turkey? Slightly edited. Originally published under the title "Anti-Semitic Academics: Where is the Outrage Against Turkey?" 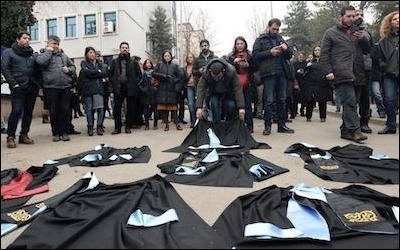 Academics at the Cebeci campus of Ankara University in Turkey lay down their gowns in solidarity with their purged colleagues, February 10, 2017. In Turkey, academics are currently at the mercy of President Recep Tayyip Erdogan, who demands their compliance and threatens dissenters. After last July's failed coup (for which Erdogan blamed an American scholar), a series of emergency decrees have specifically targeted Turkish academia. One would think this assault would raise ire from Western ivory towers, but as Turkey slides deeper into totalitarianism, academia yawns. The failure of many professors to stand up vigorously and publicly for what they profess is especially notable in those whose careers are focused on the demonization of Israel through various iterations of the Boycott, Divestment and Sanctions (BDS) movement. All right, it is summer break and everyone is off doing research, writing novels and looking for grant money. But Erdogan's crackdown is not new. Most of it was ignored until January 2016 when he targeted a group of Turkish scholars who called themselves "Academics for Peace" for producing a petition demanding that the Turkish government "end the massacre of the Kurdish people." As Turkey slides deeper into totalitarianism, Western academia yawns. Since the failed coup, Erdogan has increasingly behaved like a paranoid dictator flexing his muscles. In the last 12 months alone, he has closed at least 15 universities and confiscated their property. Invoking Article 301 of the Turkish penal code – which amorphously criminalizes insults to "Turkishness," the Turkish government or the Turkish military – he has also closed down numerous publishing houses. He has forced Turkish journals to remove from their editorial boards scholars who criticize him. Hundreds have been fired and blacklisted. Unable to work in Turkey and, with their passports confiscated, unable to leave, they represent the worst-case scenario of every comfortable Western academic who has ever bemoaned the "chilling effect" of Republican presidents and congresses, or who have proclaimed as "McCarthyism" any criticism of their own work. Real suppression, however, making their persecution fantasies seem absurd, is mostly met with silence. Where is the moral indignation? Yet, there is no shortage of howls of "injustice" and BDS movements criticizing even the slightest perceived infringement of human rights in Israel, a country that ensures human rights and equality under the law to all its citizens. 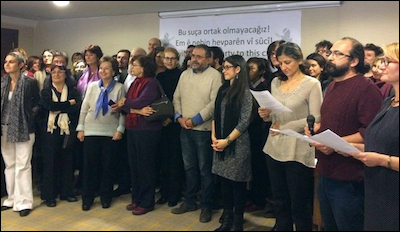 Signatories of the January 2016 "Academics for Peace" petition demanding an end to Turkey's "massacre of the Kurdish people" have been subjected to attacks and threats from the Turkish government and nationalist groups. A letter condemning the Erdogan regime and supporting the persecuted academics is the bare minimum one might expect from an easily-piqued group of people who write for a living. Escalations in severity might include organized protests, media events and other kinds of activism to reach audiences beyond readers of The Chronicle of Higher Education and Inside Higher Ed. Enlisting the help of celebrities comes next, followed by attempts at isolation in one of the few ways possible to an academic institution, such as cancelling conferences and sporting events convened in the offending state or country. Next come boycotts, calls for divesture of university-controlled funds and sanctioning various individuals. So how has the academic industrial complex reacted to Turkey? While their Turkish colleagues in the US are intimidated into silence by threats to their families back in Turkey, most of academia seems still traumatized by the defeat of Hillary Clinton in November 2016. Aside from the proverbial "strongly-worded letters," academia's wheels of outrage seem stuck in neutral. If half of the opprobrium consistently leveled at democratic Israel were applied to autocratic Turkey, it might bolster the anti-Semitic claims Israel is not being treating differently than every other country on the planet. The Middle East Studies Association (MESA), which clearly supports the attempts to smother Israel through economic means, has been the most active of all academic groups in its condemnation of Erdogan. Many of the facts of Erdogan's crackdown are accurately described in the dozens of letters MESA has sent to Erdogan, Ahmet Davutoglu and Binali Yildirim. But there are no apparent signs of protests or other forms of activism usually deployed by MESA's leadership. Its website suggests that today MESA is far more focused on the Trump administration than on the Middle East. The National Women's Studies Association overwhelmingly supports attempts to crush Israel economically, but has managed only one letter about the situation in Turkey, dated December 21, 2016, almost a full year after release of the "peace petition." No subsequent statements are listed. California's UAW Local 2865 union goes all out protesting against Israel, but offers little more than tepid criticism of Turkey's massive crackdown on academics. Another great supporter of obliterating Israel through economic demands is California's UAW Local 2865. The union represents over 13,000 graduate students and other student workers at the University of California. It sent a feeble letter on January 26, 2016 to Ambassador Serdar Kilic accusing Erdogan of "stoking a climate of resentment of academics." In spite of the American Anthropological Association's narrow vote not to endorse economic sanctions against Israel, it regularly takes action in support of those goals. But not so much when it comes to Turkey: one letter on January 17, 2016 to Davutoglu cautioning against persecuting academics who signed the peace letter, and another on March 7, 2017 to Yildirim requesting the release of an anthropologist whose work "seeks to educate the public about Islamophobia." These two letters represent a small fraction of the countless letters and advocacy actions that the AAA has taken against Israel in the same period. While the MLA is historically no friend of Israel, it recently voted not to endorse economic sanctions against the Jewish state. The MLA Members for Justice in Palestine (MLAMJP), which calls itself "a group within the MLA Commons that was established in 2014," exists for the sole purpose of anti-Israel advocacy. As of this writing its website does not address the vote against official MLA endorsement. Why are there no academic petitions for 'justice in Turkey'? Regarding Turkey, the MLAMJP is silent, and the MLA itself has managed but a single perfunctory one-paragraph statement in January 2016 (before the purge of academics) and an endorsement of a joint statement shortly after the coup attempt. Where is the outrage? Why are there no "MLA Members for Justice in Turkey"? How about librarians? A group calling itself the Librarians and Archivists with Palestine (LAP) has been advocating sanctions against Israel since 2013, and another group of "scholars and librarians working on the Middle East" distributed a letter in 2014 calling for their colleagues to boycott Israel. But when it comes to Turkey, sssshhhhhh! 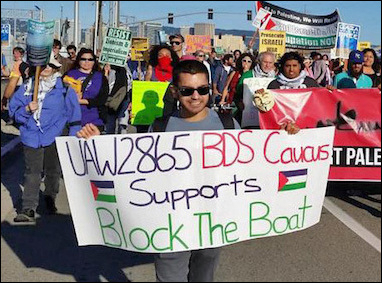 The Association for Asian American Studies approved a boycott of Israeli universities in 2013. But enter the word "Turkey" in its website search and you will find nothing. Likewise at the website of the Native American and Indigenous Studies Association Council, another supporter of destroying Israel through economic force. The thickest ironies are found at the American Studies Association which voted in 2013 to boycott Israel. It too has issued a boilerplate statement in support of academic freedom in Turkey, but no protests, boycotts or sanctions are suggested. Its subsidiary, the American Studies Association Turkey (ASAT) will convene its annual conference (another Erdogan-approved affair) this November at Hacettepe University in Ankara on "Manifestations of Love and Hate in American Culture and Literature." No one can deny what Turkey has become under Erdogan. By successfully commandeering a complex electoral process he has assumed the powers of a dictator. Like a little Putin who dreams of reviving the Soviet Union, Erdogan dreams of reviving the Ottoman Empire. He is everything academia and the Left profess to hate: a power-hungry, megalomaniacal thug. The silence on Turkey of pro-BDS academics reveals much about their indignation toward Israel. Perhaps when the new academic year opens this fall, some MLAMJP-ers will find Turkish parallels to George Orwell's 1984 and Ray Bradbury's Fahrenheit 451. Historians might explore 20th-century precedents to Erdogan's rise to power via democracy and subsequent efforts to wipe out democracy. Social justice warriors, humanists and feminists might find common cause in their outrage over Erdogan's suppression of academic and other freedoms. Perhaps academia will actually transcend its pro-forma committeespeak solidarity with Turkish scholars. Right now, however, the silence of these organizations tells more about them and their real motives than about the object of their unjustified indignation: Israel. A.J. Caschetta is a Shillman-Ginsburg fellow at the Middle East Forum and a senior lecturer at the Rochester Institute of Technology.